One in a series of articles on travel in the Kansai region of Japan. Find the rest here. 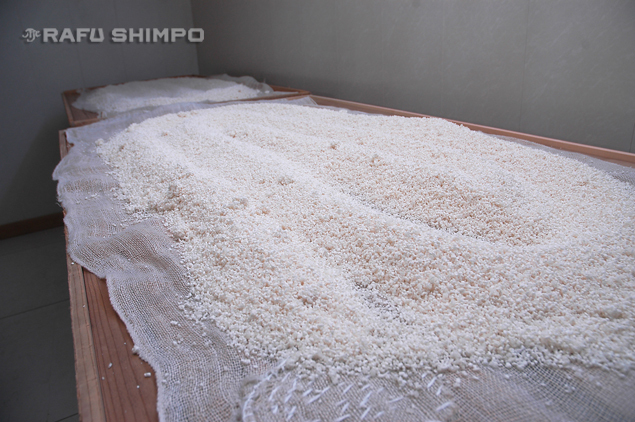 Cooked rice is combined with a special mold called koji, and is then allowed to sit for up to 45 hours. Afterwards, water and a yeast starter are introduced into the mixture, beginning fermentation, which can last for two weeks or more. Whether you’ve a particular penchant for sake or not, a visit to one Japan’s oldest sake breweries is a simple yet fun side trip in Kyoto. Founded in 1675 – 101 years before the United States was formally a nation – Tsuki No Katsura is located in the Fushimi district, on a street that was often used by local noblemen as they made their way to the capital, which at the time was Kyoto. The name is taken from a kind of tree that in mythology is said to have first grown on the moon, some 2,000 years ago. True or not, the traditions and methods deployed in creating their product have remained essentially unchanged over centuries. The company is known for creating the first sake distinguished by its cloudy appearance and sparkling texture. 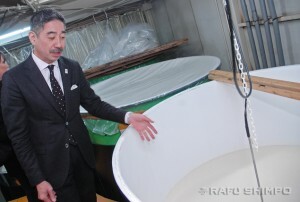 Iwai Nigori sake is made without pressing out the particulate matter from the rice, leaving the finished product opaque. It is one of the best-selling products from Tsuki No Katsura. The company’s sakes have been celebrated across the globe, and range in price from a mere 420 yen to over 5,000 yen and up. Most products are available online. Masuda explains the fermentation process, during which the rice and water mixture gives off a distinct smell of bananas. But for those without much of a palate for sake, there’s another attraction here. Besides visiting the lovely, wood-grained facility on a hilltop road and having the opportunity to taste the sake, there is the entertainment factor, courtesy of one of the owners, who served as the host for our tour. Tokubee Masuda’s business card describes him as “Committee Chairman for Overseas Sake Promotion,” but it might as well add “emcee.” Complementing his generations of knowledge about sake, he comes off as a cross between Peter Sellers and the Marx Brothers, providing for a very entertaining visit. The Tsuki No Katsura Sake brewery and cellar is located at 135 Nagata-cho in the Fushimi district of Kyoto, about 8 minutes by taxi from Kyoto Station. For more information, visit the website or call (075) 611-5151. 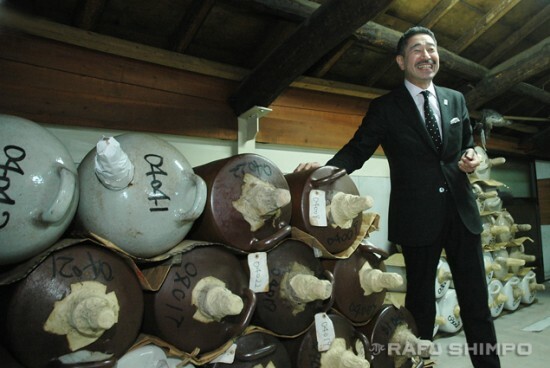 Masuda with a bottle of Iwai Nigori sake, one of the company’s most popular.